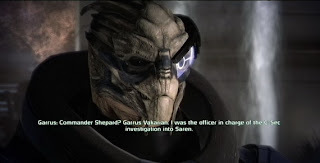 We're back with more Mass Effect talk, this time with a discussion of Mass Effect 2 and 3 (which isn't out yet, though that doesn't stop us from spending a good portion of the episode on it). By the way, SPOILERS. Seriously, don't say I didn't warn you. If you've got something to say about Mass Effect or our opinions thereof, do let us know through the comments or e-mail. Show notes and links will be posted after the break momentarily. [00:15] Evan re-introduces the podcast. Make sure you listen to Part 1 first! [00:36] EVERYTHING IS BETTER. (Not really, but close.) Combat is certainly better! [04:17] Daryl talks about the ups and downs (eh heh heh) of the Mako tank from Mass Effect 1 and Mass Effect 2's response to some of those problems. [08:09] Mitchy brings up the "Normandy Crash Site" DLC, which leads us into a discussion of Mass Effect 2's DLC. [12:23] What kinds of things transfer between the games, and how will that affect Mass Effect 3? [13:19] Romances come up. Daryl and Mitchy hate Jack. Evan disagrees. [19:00] We talk about character interactions, and Evan talks about his feeling of "connection" with the team. [23:32] Should you play both Mass Effects, or just skip to the considerably better Mass Effect 2? We answer your pressing question. That transitions into discussion of how your choices in 2 might effect big things in 3. [36:05] Daryl complains about ME2's lack of urgency in most of its missions. [40:44] You don't want to be playing the meta-game in the Mass Effect games, or else you'll miss out on great revelations and unexpected options. [46:36] Everybody gives their final thoughts, which involve the overall gameplay structure of Mass Effect, the sense of connection between the player and characters, and the DLC situation. [1:05:06] Daryl writes for Otaku USA Magazine and runs the Anime World Order Podcast. Mitchy writes for BitMob and hosts his own podcast, End Of Line.